Prince George's County fire officials say multiple cars, vans and buses were found burning in a parking lot at an Upper Marlboro park. UPPER MARLBORO, Md. – Prince George’s County fire officials say multiple cars, vans and buses were found burning in a parking lot at an Upper Marlboro park. The burning vehicles were discovered around 5 a.m. Wednesday at Watkins Regional Park, Prince George’s County Fire/EMS spokesman Mark Brady says. 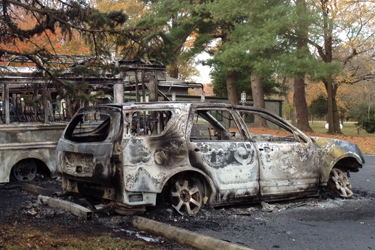 Eleven vehicles were charred on the property — 10 of the vehicles belong to the Maryland-National Capital Park and Planning Commission, while one did not, says Anita Pesses, chief of public affairs and marketing for Prince George’s County Department of Parks and Recreation. The vehicle that does not belong to the M-NCPPC was stolen from D.C., according to officials. Brady says it appears that vehicle was dumped and set on fire, and wind helped spread the flames to other vehicles. Authorities have classified the incident as arson. Brady says fire crews extinguished the blaze and no one was injured. The vehicles were damaged extensively, says Pesses, although the cost of damage is not yet clear. The M-NCPPC vehicles damaged in the blaze were used to transport customers to things like senior activities and after-school programs, Pesses says. When the vehicles are not used overnight, they are parked outside the administrative offices in Watkins Regional Park. The department is working to find vehicles to temporarily fill the county’s needs. Pesses says while Watkins Regional Park is closed after sunset, it’s difficult to regulate the hours. Pesses says in her 24 years working for the department, she has never seen anything comparable to the charred vehicles all in a row. WTOP’s Kristi King and the Associated Press contributed to this report. Follow @WTOP on Twitter.